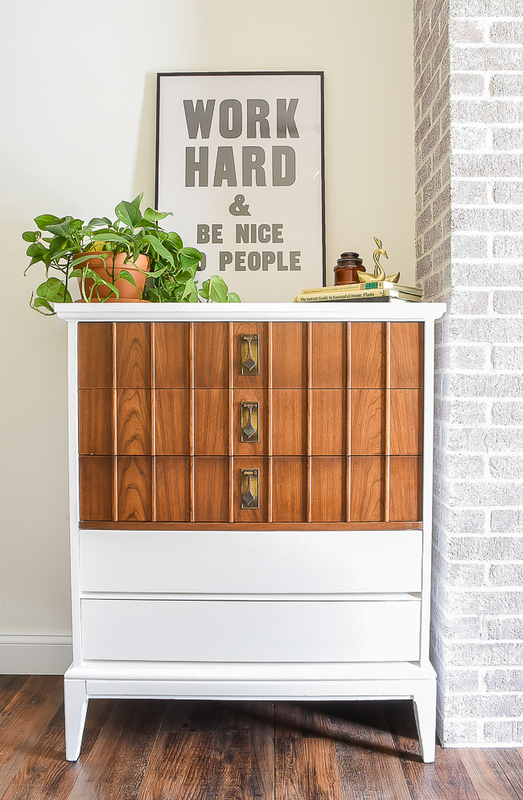 A little paint and TLC goes a long way in updating this beautiful MCM Dixie Highboy dresser. Sometimes thrifting can be a total miss and sometimes it can result in a cart full of treasures and awesome furniture scores. Last week, my mom and I headed to a few thrift stores and it ended up being one of those trips that I was thankful we took her Expedition. 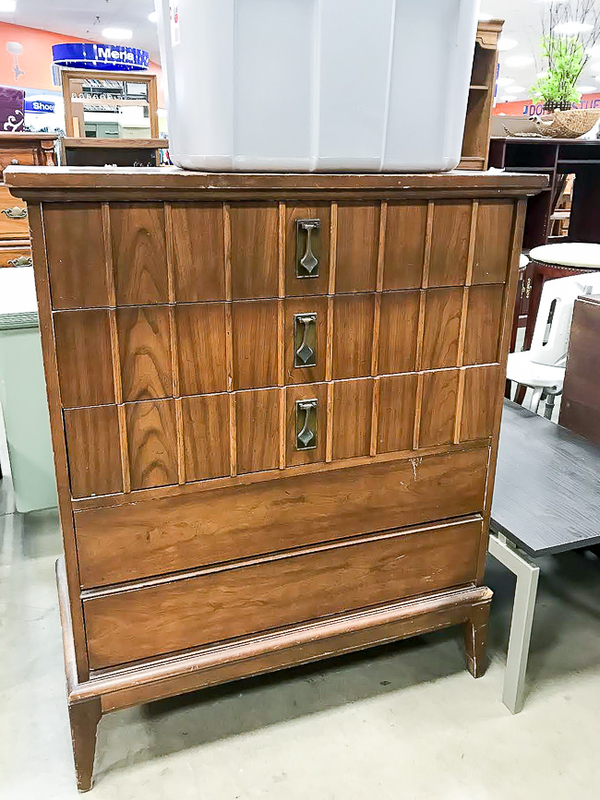 Not only did I find some great smaller items, but I also scored an awesome mid-century modern Dixie highboy dresser. I'm always drawn to MCM pieces and knew right away that it had to come home with me. 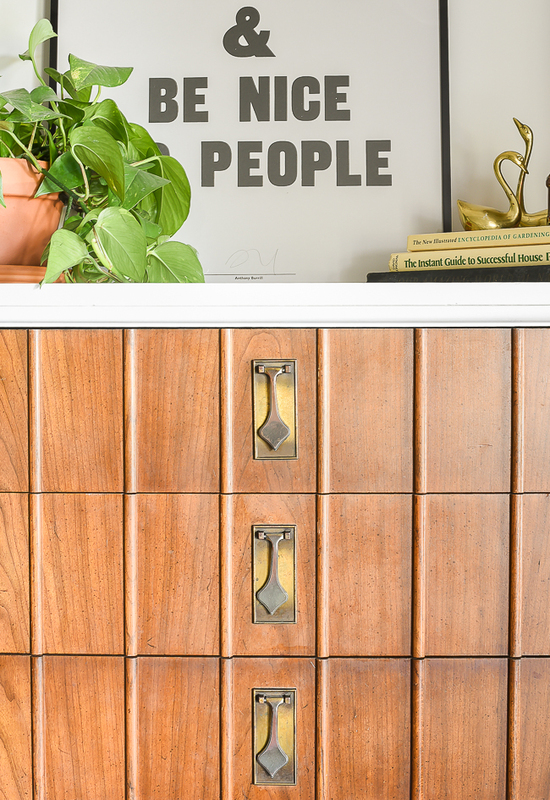 Just look at the beautiful hardware and detail on the drawers. Okay, so there's a few knicks and chips in the veneer and it looks like something chewed one of the legs, BUT with a little TLC I knew I could make it beautiful again. 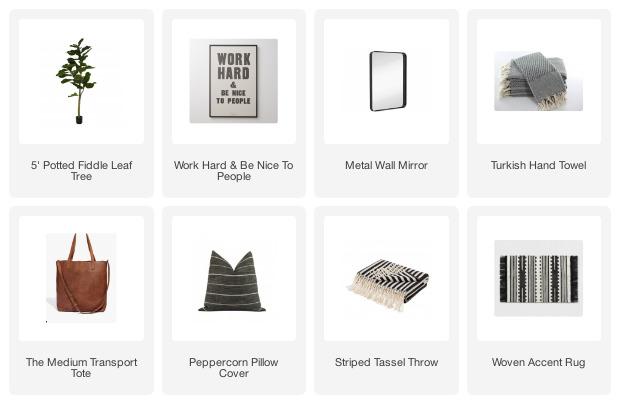 SUPPLIES USED: Affiliate links have been used. I was so excited about this piece that I started working on it right away. I removed all the drawers then gave the entire piece a good sanding with my Corner Cat hand sander. The bottom drawers were a bit more damaged than I would have liked so I had no other choice but to repair and paint them. The chips in the veneer got filled with wood putty and the scratches got sanded. There were also a few chips in the top three drawers, but I really wanted to keep them as is, so I simply touched up the chips with Minwax dark walnut stain. After the damage was repaired and the entire piece was sanded I wiped it down with a damp cloth and gave it a good cleaning with Simple Green. This step is important. You want to make sure you get all the dust off before painting. You can use tack cloths, but I find that paper towels and a good cleaner work just as well. 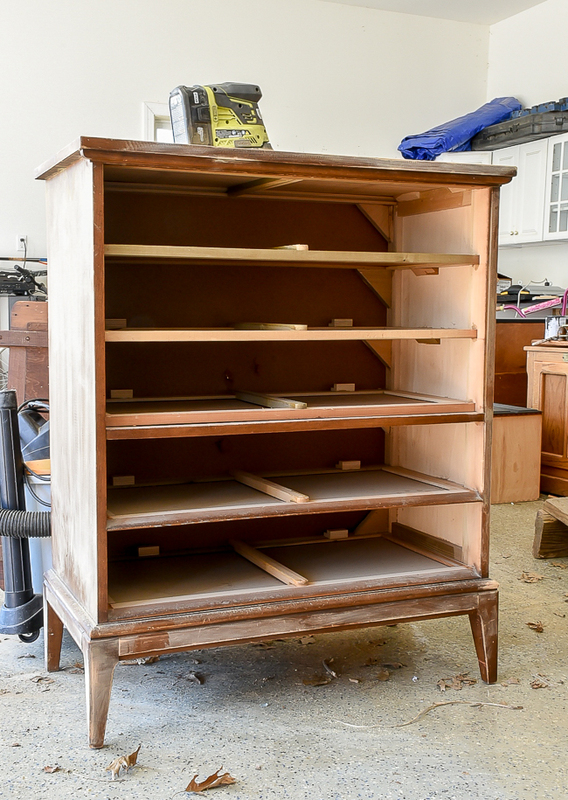 Once I had the dresser clean, I applied two coats of Zinsser Shellac Base Primer. 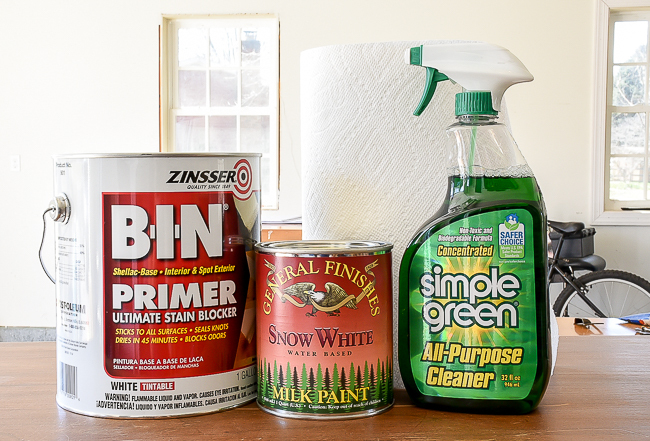 This is my absolute favorite primer to use on furniture, especially on laminate or if I'm not using chalk paint. You can also buy it in a spray can, which I love using for smaller projects or when I want a really smooth finish. After the primer, I applied 3 coats of General Finishes Snow White milk paint. 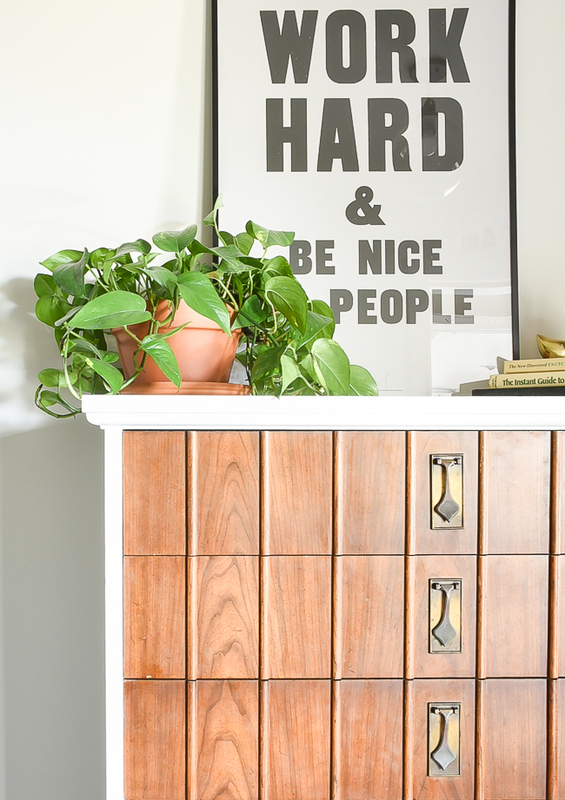 You probably wouldn't need 3 coats if you were going for a more distressed look, but this MCM dresser screamed for a sleek modern makeover, so 3 coats it was. I finished off the piece with General Finishes Satin Finishing Wax, which I applied with a clean rag. I simply rubbed it on, let it sit a few minutes then buffed it out. As soon as the wax was dry I heaved the dresser up the garage steps by myself (where there's a will, there's a way!) and into the mudroom to take pictures. When you're home alone and have pictures to take you gotta do what you gotta do, right? I don't know what I love more, the contrast of the crisp white paint against the wood or the gorgeous original hardware. 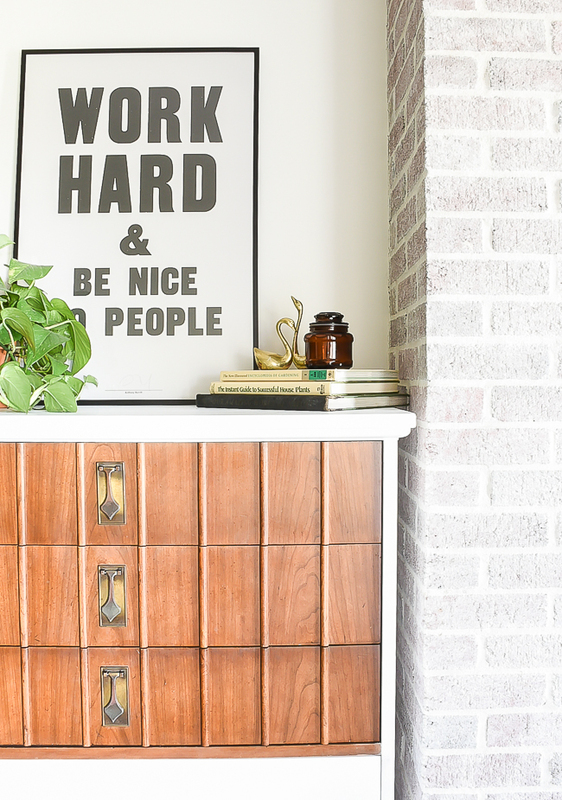 I staged it with my favorite office art and a few thrifted finds that will eventually make it to Sweet Clover. 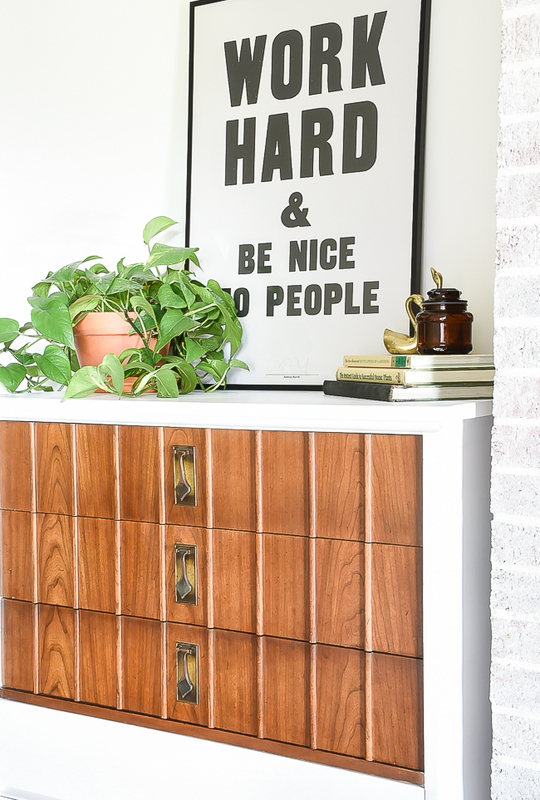 This beautiful MCM dresser will be heading to Sweet Clover for the May sale and I have to admit, I'm going to be a little sad to see it go. I know it will make a great addition to someone else's home, but I sure do wish I had a place for it in ours. it turned out so beautifully!!! You did a beautiful job. You had good bones to work with. Wonder what it cost at thrift store? I'm thrift shopping today, hope I have your luck. what does MCM stand for? Mid Century.....? The dresser turned out beautiful!!!!! I've been wanting to use GF Milk Paint. Have you used in the past? Pros/Cons of it? Thank you so much! 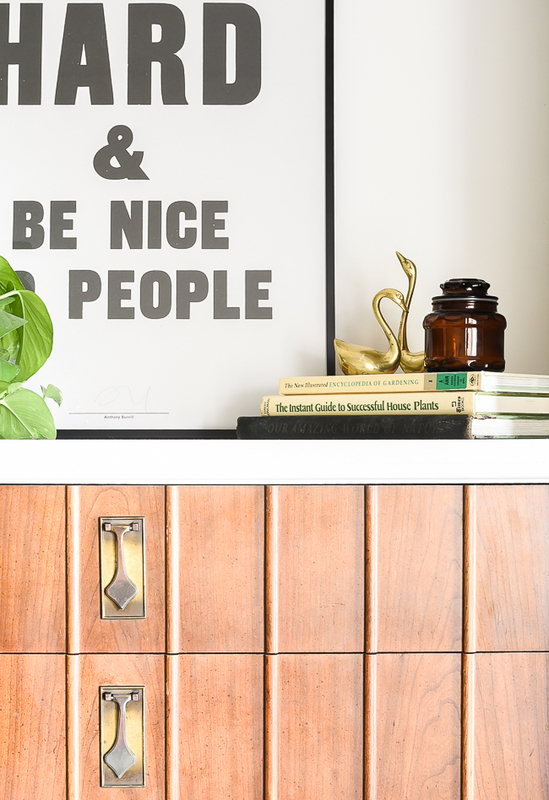 Yes, I've used GF milk paint in the past and actually prefer it over chalk paint. It's thinner and goes on smoother for a nice clean look. If I'm heavily distressing a piece I would still probably go with chalk paint though. It really just depends on the piece. Oh my word! I can relate to your heaving! I am in the process of remodeling, redoing, and moving furniture. Your little comment gave me a chuckle! Thank you for sharing your project, it look s great!